As we all know, Valentine's Day is on the horizon! Our North Greenhills Association would like to celebrate the day of hearts with a "special and free" event on February 12, Thursday that we have organized for the residents of the village at the Clubhouse Social Hall. In order to foster a spirit of kinship and camaraderie we are inviting all neighbors and your friends to come to our Valentine's Day gathering for a relaxing evening with good food, good music & good dancing. There will be FREE roving dance instructors present for those who want to hit the floor and shake it up! FREE box of chocolate will be given away to those who will attend courtesy of Ms. Trini Sia & Family. Keeping our surroundings clean specially the areas fronting our own homes is primarily the homeowner's responsibility. We have made a lot of progress towards cleaning and maintaining our surroundings that we could compare or even surpass our neighboring villages in this regard. May we remind our dear residents once again that maintaining our village especially its sanitation and cleanliness is everyone's concern. Strictly being implemented is the no littering, no garbage outside the house and no dumping at vacant lots regulation. In line with our continuous endeavor to clean up the village the Environmental and Sanitation Committee headed by Ms. Trini Sia have decided to conduct a refresher course on "Zero Waste Management" on February 28, Saturday from 9am to 11am at McKinley Pavilion to familiarize ourselves and particularly our new household help with the use of the waste converter and the eco-center where our wastes are treated in accordance with the provisions of RA 9003 which is entitled " An Act providing for an Ecological Solid Waste Management Program". Please encourage your household help to attend this re-fresher course as we retrain them on how segregate and treat your household waste. converter and (1) kilo bokashi per household will be given away to those who will attend the seminar!! At the request of our neighbors and as part of the anti-dengue drive which is also a part and parcel of our sanitation & beautification program in North Greenhills we will conduct fogging/fumigation operations for mosquitoes and crawling insects starting Feb 16, 2015. Notices will be sent out to homeowners for the schedule of fogging/misting in your respective backyard and gardens. We will also be doing EM1 pouring in all our drainage canals surrounding the village to eradicate insects. NGA car stickers for the year 2015 will be available starting February 15, 2015. Application forms are available at the NGA Admin Office. We are still adopting the RFID system to minimize the proliferation of "fake stickers". Processing will take at least two (2) weeks and vehicles will have to be brought to the NGA Clubhouse (Johnson Park). We enjoin everyone to apply early. RED stickers are for non-resident family members, relatives & friends. These may be purchased at P3,600 per sticker. Red sticker is allowed only from 6:00am to 10:00pm. The 2014 NGA car stickers will only be valid until March 31, 2015. The "NO sticker - NO Entry" will be strictly enforced. 2. Lets' get down to" WORK"
I would like to update our residents on the issue of the Proposed Re-Zoning Ordinance of San Juan City. Mayor Guia Gomez invited the members of the North Greenhills board together with the board members of the other Barangay Greenhills villages and associations to the En Banc hearing of the Sangguniang Panlungsod, presided over by Vice Mayor Francis Zamora, for the Proposed Re-Zoning Ordinance of San Juan City last Friday, November 14, 2014. This provided us a good opportunity to voice out the sentiments of our residents. I am glad to report to you that Mayor Gomez immediately agreed to the request of the Barangay Greenhills villages to keep the status quo, meaning there will be no re-zoning for us! To provide a brief background for the sake of those who have not been following developments on this issue, Barangay Captain Alan Yam called a Barangay Greenhills Assembly concerning the Proposed Re-Zoning Ordinance last October 12, 2014, where City Architect Romy Gonzales gave a briefing on the subject and answered questions posed by the residents. The portion in the Proposed Re-Zoning Ordinance which caught the attention and vehement objections from the residents is the section on the use and regulations in the high density residential zone areas, which allows the construction of medium-rise, multi-use (including commercial) buildings. Varied concerns were brought up with regard to privacy, the residential nature of the villages, security, parking, unsustainable rapid development with implications on the adequacy of sewage, water and utilities, among others. After the assembly, calls from our residents for signature campaigns and posting of tarpaulins/banners expressing their objections to the proposed ordinance mounted. We advised our residents to be patient and to wait for developments before said activities were conducted in an orchestrated manner. At that time, we were waiting for the feedback of the Mayor on the issues raised during the Barangay Assembly and we were also in discussions with our neighboring villages. The swift action of the Mayor to call everyone concerned to the En Banc Assembly was indeed very timely. We hope that through such dialogues, we will always be given the opportunity to clarify concerns, find a common ground and reach a favorable resolution to pressing issues in a peaceful manner. 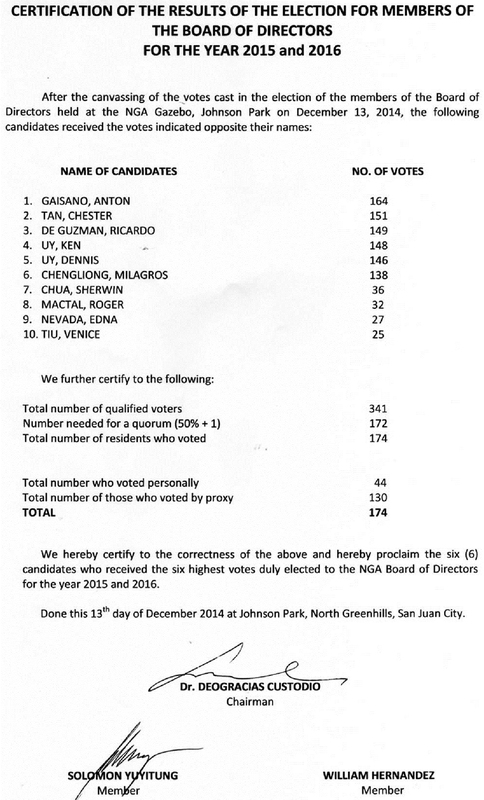 Those nominated to run for the six (6) vacant slots for NGA board members were already advised of their nominations. The official list of candidates will be released on Dec 1, 2014. In this regard, we are hereby extending the deadline for submission of proxies to December 3, 2014 to give a chance for our residents to evaluate the nominees. Proxy forms submitted after this deadline will not be honored. Elections will be held on Saturday, December 13, 2014 at the NGA Gazebo, from 9:00 a.m. to 3:00 p.m. Please come and VOTE! The General Elections for the six (6) vacant slots in the NGA Board of Directors will be held on Saturday, December 13, 2014 at the NGA Gazebo from 9:00 a.m. to 3:00 p.m. Attached is the Nomination Form which should be submitted to the NGA Secretariat on or before the deadline at 5:00 p.m. on Thursday, November 13, 2014. Forms submitted after the deadline will not be accepted. Those nominated will be advised accordingly on Saturday, November 15, 2014 and will be given two (2) weeks or until Saturday, November 29, 2014 to decide whether or not they will accept their nominations. On December 1, 2014 the list of official candidates for NGA Board of Directors will be announced. Also attached are the Proxy Forms. Qualified voters who will choose to vote by proxy should fill out both Original and Duplicate of the Proxy Form which should be submitted for validation to the NGA COMELEC at the NGA Admin Office on or before 12:00 noon on Friday, November 28, 2014 to give our COMELEC enough time to validate these. Proxy forms submitted after the deadline will not be accepted. 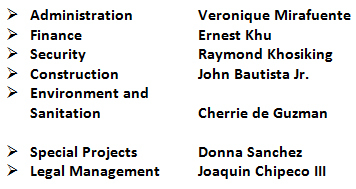 We hope you will participate actively in choosing six new members of the NGA Board for 2015-2016 who will serve with dedication and with the highest interests of our residents in mind. As we approach the last trimester of our Year of the Laity, we join hands in thanksgiving for all the blessings the Lord has showered on us individually and on our association. May we continue to be blessed with the grace to live our legacy of being authentic witnesses of our faith to the young. There was a Barangay Assembly or public hearing organized by Barangay Captain Alan Yam last October 12, 2014 to discuss the City of San Juan's proposed rezoning ordinance. The venue at the Annapolis Wilshire Plaza was filled with representatives and residents from North, Northeast and West Greenhills who voiced out unanimous objections to the proposed ordinance, particularly on the provision allowing the construction of mixed-use (example: dormitories, galleries, commercial establishments, etc. ), medium-rise buildings (up to six storeys) inside the gated villages in Barangay Greenhills. Many arguments were brought up, strongly pointing out issues with regard to privacy, the residential nature of the villages, security, parking, unsustainable rapid development with implications on the adequacy of sewage, water and utilities, among others. Those who attended expressed their willingness to participate in future activities related to this matter, like mounting a signature campaign and organizing other assemblies. San Juan Building Official, Architect Romy Gonzalez, was present to hear the views of the residents and answer questions. He promised to bring the urgent concerns to the attention of the Mayor and the City Council. After a follow up, Barangay Captain Yam reported that he informally met with some San Juan City officials last week and after bringing up the vehement objections of the residents, he was assured that the City Council will re-study the planned rezoning and involve the residents through more public hearings. Attached is the letter of Barangay Captain Alan Yam. Our annual NGA Halloween Treat will be held tomorrow, Saturday, October 25 at 4:00 p.m. A separate circular with registration form was distributed early this week for the guidance of our residents. We invite you to participate in the activities which give us the opportunity to get together with our neighbors in an atmosphere of fun and camaraderie. Nine food stations will be set up on the following streets: Kennedy corner Tyler, Roosevelt corner Buchanan, Roosevelt corner Van Buren, Kennedy St (fronting 11 Kennedy St), Kennedy St (fronting 47 Kennedy St), Van Buren St (fronting 41 Van Buren St), Polk St (fronting 55 Polk St), Buchanan St (fronting 47 Buchanan St), and at Polk St (fronting 15 Polk St). We would like to thank our sponsors: Viridian/Ortigas and Co. for the photo booth which will be located inside the NGA Pavilion and 40 prizes for the costume competition; East West Bank for 800 loot bags to be distributed through the 9 food stations; Oshkosh for costume competition prizes. The NGA special loot bags will be given to the first 500 registrants at the McKinley basketball court. The All-Greenhills Garden Club continues to gather more residents who attend the weekly Wednesday afternoon lectures on garbage segregation, basic horticulture of fruits, vegetables and ornamentals, demonstration and lecture on bonsai plants and orchids, among other interesting topics. Last October 22 there was a lecture and demo on Flower Arrangements to help us prepare for All Saints Day and All Soul's Day. On November 26 the topic will be "Care of Garden Pets" (rabbits, guinea pigs, birds) and on December 5 the topic will be Christmas Plants. November 28, at 12:00 noon: Deadline for submission of proxies to give a chance for the Comelec to validate these. Proxy forms submitted after this deadline will not be honored. Total receipts as of end-September amounted to P24,937,520.48 and operating expenses reached P20,201,673.01 giving us a balance of P4,735,847.47 We project a modest positive balance by the end of the year. The Board has decided to enroll the entire North Greenhills with Lifeline's Site-Based Emergency Quick Response Coverage. This will cover ALL persons INSIDE North Greenhills (residents, kasambahays, drivers, staff, security, workers, and guests) at the time of emergency. The 24-hour hotline of Lifeline is 16-911. Other numbers are 839-2520-30; 0916-647-7019; 0917-521-6911 and 0917-541-6911. Included in the coverage are FREE use of the ambulance during medical emergencies, FREE use of regular equipment and supplies, full endorsement to the receiving hospital, among others. Coverage was effective last October 15, 2014. The new NGA Directory and Admin Manual will be ready for distribution on December 13. We always look forward to working with you, living together as one NGA community and thank you for your continued support and cooperation. On behalf of the NGA Board, please allow me to greet you on the Feast of Our Lady of the Assumption. In the middle of the Year of the Laity, may we be blessed with the grace to continue being authentic witnesses of our faith, inspired by Our Lady, especially to the young. The All-Greenhills Garden Club which was launched by Amb. Preciosa Soliven and Dr. Deo Custodio last March 12, 2014 has attracted more residents who attend the weekly Wednesday afternoon lectures on garbage segregation, basic horticulture of fruits, vegetables and ornamentals, demonstration and lecture on bonsai plants and orchids, among other interesting topics. 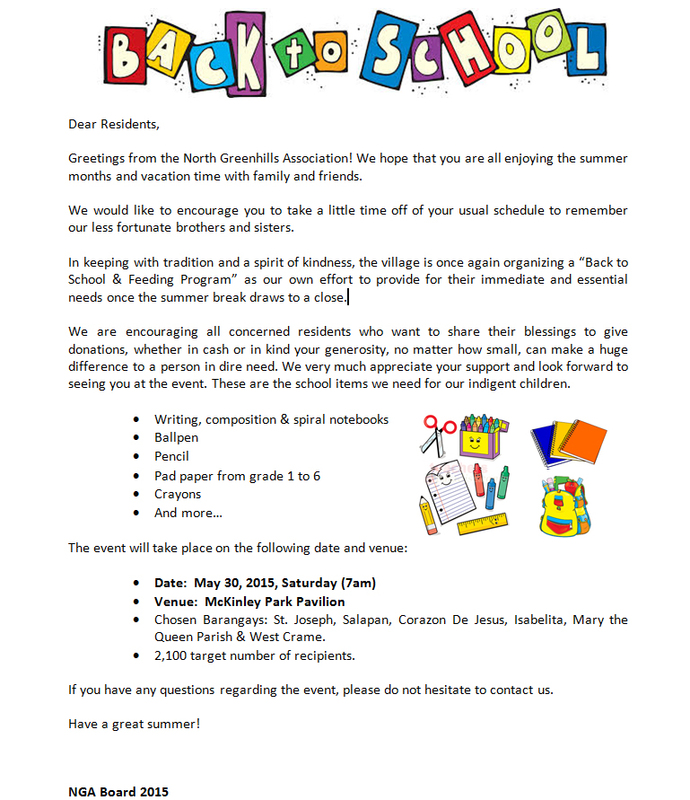 Our Summer Barbecue Party last May 24, 2014 was attended by over a hundred residents who also witnessed the Blessing of our newly-renovated NGA Pavilion. The simple get-together where we also met our new neighbors provided a venue to foster camaraderie among our residents. 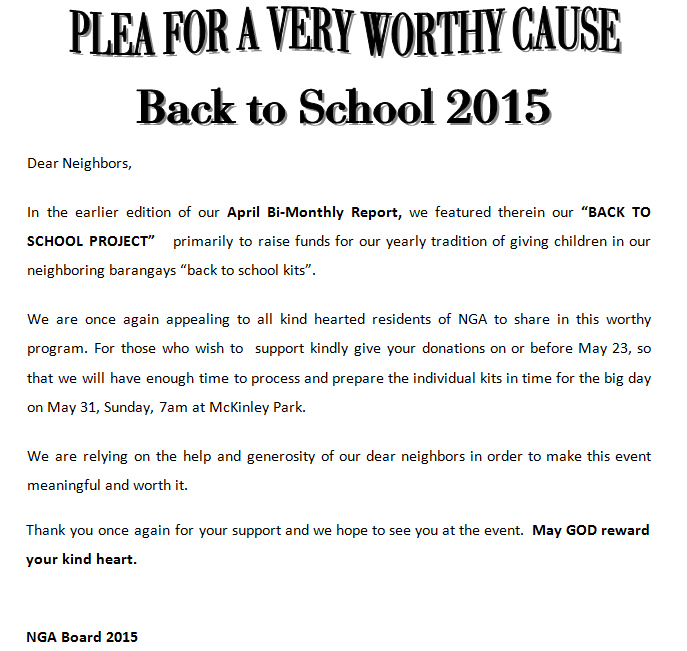 The annual Back to School/Feeding Project held last June 7, 2014 at the Mc Kinley basketball court benefited 2689 less fortunate elementary schoolchildren from Barangay Little Baguio, Barangay Kabayanan, Barangay St. Joseph, Barangay Isabelita, Barangay Corazon de Jesus, Barangay Salapan and Barangay West Crame. We also gave assistance to the children of our barangay tanods, street sweepers, guards and maintenance personnel. Thank you for the outpouring of support and your kind generosity without which this project will not be a success. The "Getting to know our Barangay Officials" Forum last July 19, 2014 was well-attended and gave us the opportunity to understand the role and responsibilities our barangay officials, the work that they do for us and the relationships they have with other government units. The participants expressed interest in making this forum a regular activity to keep us updated on what is happening around our community. Barangay Captain Alan Yam and his councilors willingly answered questions posed by our residents. The Pet Registration and Free Anti-Rabies Vaccination, courtesy of the San Juan City Veterinary Office with the cooperation of Barangay Greenhills was held last July 30, 2014 with many of our pets in attendance. We have also been active with the Federation of Residents' Association (FORA) which met last July 30, 2014. One of the issues discussed was the case of Officemetro Philippines vs. The Commissioner of Internal Revenue where the Court of Tax Appeals ruled that condominiums are exempt from paying taxes on association dues. Total receipts as of end-July amounted to P23,449,294.34 and operating expenses reached P17,213,676.89 giving us a balance of P6,235,617.45. We project a positive balance by the end of the year. We have completed the renovation of the basketball court (including restrooms) in Johnson Park, construction of new restrooms for the NGA Pavilion, the rewiring and resurfacing of the tennis courts in Mc Kinley Park and the construction of the village gate on Roosevelt St. exiting Ortigas Ave. 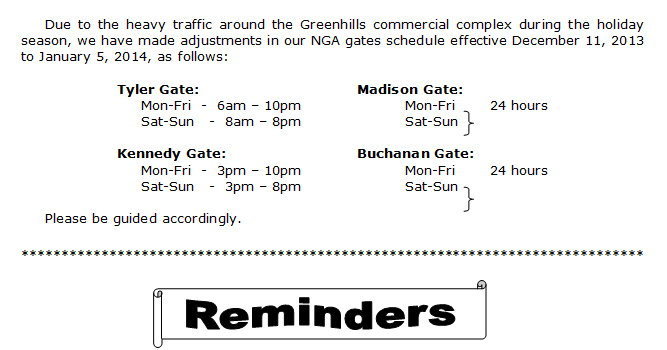 This gate will be open starting Monday, August 18, 2014 (see gate schedules below). We are now improving some existing old humps in the village which need repair. We reiterate our invitation to our resident-suppliers who may have products which you think the village can use to please contact us. Our Security Committee is still in the process of studying the ideal CCTV camera requirements for our village. Please let us know if you can help us in this matter. We are very happy to report that for the first time in history we have reached a 100 per cent collection rate of our association dues!!! Thank you for your cooperation in checking the noise levels around our immediate surroundings. While we are still receiving complaints with regard to the noise coming from some of our neighbors' houses, we notice that efforts have been made in this regard. We continue to remind our residents about dog litter in our streets and public places. We want to continue keeping our streets clean. TYLER GATE Monday to Saturday: 6:00 a.m. to 8:00 p.m.
ROOSEVELT GATE Monday to Friday: 6:00 a.m. to 8:00 a.m.
Our annual Back to School / Feeding Project will be moved to Saturday, June 7, 2014 (instead of May 31, 2014) at the NGA Pavilion. Donations in kind are still coming in and we shall need a little more time to complete on 27 May 2000 school bags. We are also conducting a house-to house visit to determine the really needy schoolchildren among the surrounding areas in Barangay St. Joseph, Barangay Salapan, Barangay Corazon de Jesus, Barangay Isabelita and Barangay West Crame. These children are given NGA claim stubs which they will present to us. The Feeding Project --- where we serve simple lugaw and drinks to the children --- will start at 7:00 a.m. and the distribution of school supplies will start at 8:00 a.m. In an effort to show solidarity with our less fortunate neighbors, we hope you and your children/grandchildren could join us even just for a while to help distribute the school supplies. Thank you for your usual cooperation and attention. We shall have a simple get-together to meet our new neighbors, a way to foster camaraderie among our residents. Please join us! Our annual Back-to-School / Feeding Project last year benefited 1971 elementary children coming from less fortunate neighboring barangays like Barangay St. Joseph, Barangay Salapan, Barangay Corazon de Jesus, Barangay Isabelita and Barangay West Crame. This year, we expect 2100 children. 2100 sharpenersThe Feeding Project --- where we serve simple lugaw and drinks to the children --- will start at 7:00 a.m. and the distribution of school supplies will start at 8:00 a.m. The Feeding Project --- where we serve simple lugaw and drinks to the children --- will start at 7:00 a.m. and the distribution of school supplies will start at 8:00 a.m.
Our sub-committee on NGA Gardens headed by Amb. Precious Soliven, has initiated the organization of an All-Greenhills Garden Club. This summer, she, together with Dr. Deo Custodio, have lined up Basic Gardening activites from 4:00 p.m. to 6:00 p.m. every Wednesday at the Soliven Gardens, McKinley Park. In the survey we conducted last year with regard to suggested services the residents wanted to have in the area near the McKinley tennis court/ Buchanan side, many proposed the following: remittance center, ATM machine, beauty parlor, massage therapy, coffee shop, gym, among others. We have approached operators of some of these facilities and most of them said it will be unprofitable for them to put up businesses ONLY FOR NGA RESIDENTS / NO OUTSIDERS ALLOWED, a condition we had to impose for the security of our residents. We, however, received offers from two residents who would like to operate a village coffee shop which will cater ONLY to our NGA residents. If there are other residents interested, please submit your proposals before the end of May. In my last report, I mentioned that one of our major projects is the gradual (3-year program) installation of CCTV cameras throughout all the strategic corners in the village. Please let us know if you can help us source these surveillance cameras. Our Committee on Security has been talking to several suppliers to participate in the bidding, but we have not yet shortlisted any company as we want to get the best offers and be very transparent about the process. We would like to thank our resident-suppliers who have given us big discounts on supplies. For those of you who may have products which you think the village can use please let us know so we can also show our support for our residents. We would like to thank all our residents for the prompt payment of association dues. We are happy to report that ALL, except one resident, have paid their dues before the deadline last March 15, 2014. Our newly updated directory is currently being completed. May we remind those who have not filled out the directory form to please do so now. We shall retain the previous information for those who do not submit updates. In view of the worsening traffic situation on McKinley/Club Filipino Drive due to the construction of Uni Mart, the Board has decided to open the Roosevelt gate ONLY during peak hours (6:30 a.m. to 7:30 a.m. and 2:00 p.m. to 4:30 p.m.) effective July 30, 2014 to help ease the flow of traffic. Like the Tyler and Kennedy gates, the Roosevelt gate will be strictly for those with NGA stickers only (no inter-village stickers allowed). For your information, Barangay Greenhills had initial plans of constructing a Barangay Office outside the Roosevelt Gate, thinking that we will not use the gate anymore as it was permanently fenced. When we explained that the board decided to open the gate due to the traffic situation, our Barangay officials immediately understood our predicament and will no longer push through with their plan of putting up an office outside the gate. A gentle reminder: we continue to receive many complaints with regard to the noise coming from some of our neighbors' houses --- from the loud chatter of our kasambahays to uncontrollable barking of our dogs to honking of horns especially late at night. Let us be conscious of the need for quiet surroundings. There has also been an increase in dog litter in our streets and public places. Kindly remind those who walk our dogs to please bring paper to pick up dog litter. We would also like to remind our residents that our NGA facilities/maintenance workers may be used for minor house repairs. There is no charge for small, simple work to be done. Daily wages shall be paid to the Admin office for half day or whole day work. Please coordinate with the Admin office for scheduling purposes and not directly with the worker concerned. We always look forward to working with you, living together as one NGA community and thank you for your continued support and cooperation. God bless you! On behalf of the NGA Board, please allow me to greet you in the midst of the Easter season, a time when we reflect on the passion, death and resurrection of our Lord Jesus Christ. In this Year of the Laity, we continue to be called as authentic witnesses of our faith, especially to the young. Blessing of the newly renovated NGA Pavilion, Saturday, April 5, 2014, 5:00 p.m.
We would like to invite all our residents to attend the blessing of our newly renovated Pavilion. This will be followed by our regular first Saturday anticipated mass at 5:30 p.m.
Total receipts as of end-March amounted to P17,961,019.02 and operating expenses reached P8,453,521.91 giving us a balance of P9,507,497.11. With a healthy financial position, we are now able to continue with projects which were on hold like: the renovation of the basketball court (including restrooms) in Johnson Park, rewiring and resurfacing of the tennis court, installation of a handicap lift in the Social Hall, installation of additional CCTV cameras (in several phases according to priority locations), additional road humps, among others. Our sub-committee on NGA Gardens headed by Amb. Precious Soliven, has initiated the organization of an All-Greenhills Garden Club which meets every last Wednesday of the month at the Soliven Gardens. They already had two sessions on garbage segregation and other matters. A summer program is being lined up with weekly activities for everyone. We would like to thank our residents for participating actively in Earth Hour last March 29 to show our concern for global warming. The World Wide Fund for Nature Philippines has given NGA a citation on our participation. Our Santuario de San Jose Parish Lenten calendar is posted in our Madison and Buchanan gate areas. Please take time to check this out so we can participate and have a meaningful Lenten celebration. A gentle reminder: we have been receiving complaints with regard to the noise coming from some of our neighbors' houses. We would appreciate your checking this out. In view of the worsening traffic situation on Club Filipino Drive due to the construction of Uni Mart, the Board has decided to open the Roosevelt gate during peak hours to help ease the flow of traffic. Like the Tyler and Kennedy gates, the Roosevelt gate will be strictly for those with NGA stickers only. Please contact our various committee heads who will be more than happy to have members among our neighbors who could participate and contribute fresh ideas. Please be reminded to VOTE on Saturday, December 14, 2013, at the Gazebo, Johnson Park. If you will not be able to personally vote, please give your proxy to any NGA resident who can vote on your behalf. Thank you for your usual kind attention and participation. Our NGA Admin office shall receive donations in cash or in kind for the victims of super typhoon Yolanda which has set a world record as the strongest tropical cyclone to hit land in world history. The catastrophic damage could not even be determined as we continue to receive devastating reports on new death tolls and the extent of destruction every day as communication lines and power were cut-off for days. We shall send the donations in kind (rice, water, other food items, clothing, blankets, etc) through the Philippine Air Force as they have the planes to reach the remote areas where there are no commercial operations. We have set up a re-packing center at the Gazebo in Johnson Park and urgently need volunteers to help pack relief bags starting Tuesday, November 12, 2013. Kindly send your donations as soon as possible. Cash donations will be sent via the parish churches in the affected areas through the kind office of His Eminence, Cardinal Luis Antonio G. Tagle, Archbishop of Manila. Thank you for your utmost generosity and continued spirit of communion with the unfortunate victims of this monstrous typhoon. The General Elections for the five (5) vacant slots in the NGA Board of Directors will be held on Saturday, December 14, 2013 at the NGA Gazebo. Attached is the Nomination Form which should be submitted to the NGA Secretariat on or before the deadline at 5:00 p.m. on Saturday, November 16, 2013. Those nominated will be advised accordingly on Monday, November 18, 2013 and will be given two (2) weeks or until December 2, 2013 to decide whether or not they will accept their nominations. 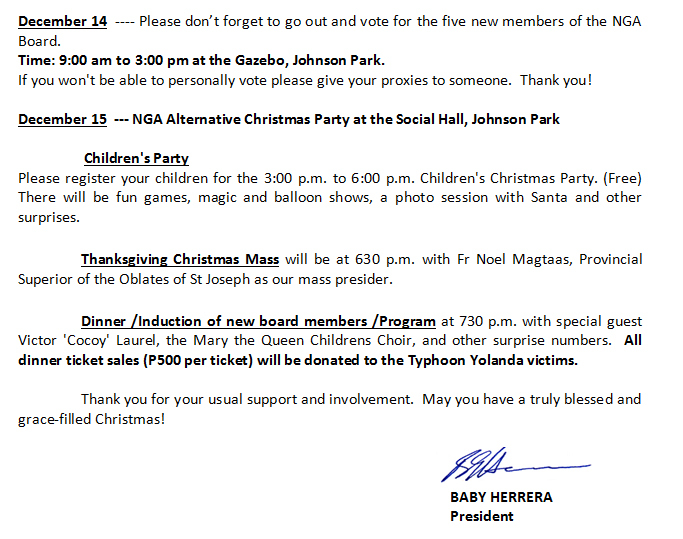 On December 6, 2013 the list of official candidates for NGA Board of Directors will be announced. Also attached are the Proxy Forms. Qualified voters who will choose to vote by proxy should fill out both Original and Duplicate of the Proxy Form and should be submitted for validation to the NGA COMELEC at the NGA Admin Office on or before 12:00 noon on Saturday, November 16, 2013. We hope you will participate actively in choosing five new members of the NGA Board for 2014-2015 who will serve with dedication and with the highest interests of our residents in mind.